Happy 2017! How did you begin your new year? Mike LeValley woke up before 6:00AM and drove forty-five minutes to the Bundy Hill Preserve to lead an early morning walk. In the pre-dawn twilight, he was joined by a group of other nature lovers for a sunrise hike. 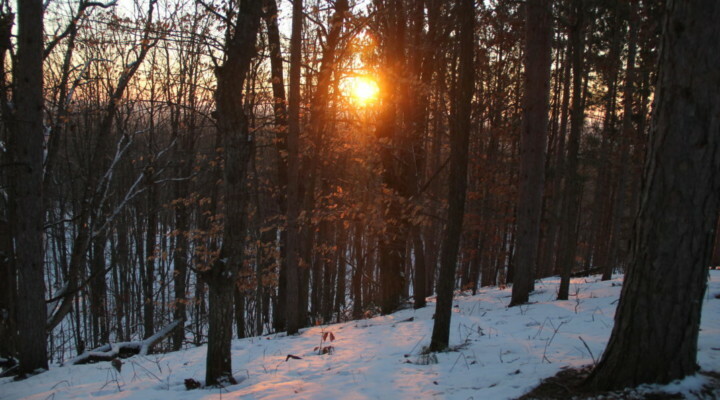 At approximately 1,270 feet above sea level, Bundy Hill is the highest point in Isabella County. From the parking area, a half-mile trail led them up and down over snow covered hills to the summit of Bundy Hill. While most of Isabella County is flat or gently rolling, Bundy Hill is part of a glacial moraine that rises above the rest of the county. The trail to the summit climbs about 150 feet from the parking area and can be a bit of challenge when covered with snow. They arrived at the summit just a few minutes before the sun peaked over the horizon. This gave them the opportunity to explore. Some of the group went west to a false summit that offers open views to the south. The rest of the group remained at the peak. While waiting for the sunrise, a few late arrivers trickled onto the scene. By the time 8:09 AM (the official time of sunrise) rolled around, there were fourteen people gathered at the top of Bundy Hill – with two more stragglers to arrive soon. Fortunately, it was a good morning for the hike. Right on schedule a brilliant reddish-orange sun rose on the eastern horizon. The summit of Bundy Hill is surrounded by trees so it lacked a clear view of the sunrise, but it could be seen peeking through the trees. The sun elicited all the appropriate oohs and ahhs from the crowd. Some of the happy hikers recorded the event with photos or videos; others were happy to just revel in the dawning of a new day and a new year. A quick group photo with the sun in the background, and people began to trickle back down the trail to begin their day. Mike lingered a while longer, taking photos from points along the trail.